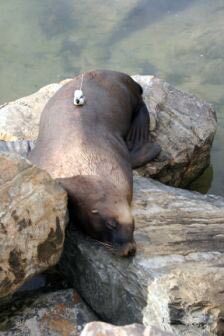 Australian Sea Lions are listed as rare under South Australian legislation. They are one of the most endangered pinnipeds (seals and sea lions) in the world. You can find them found on the south and west coasts of Australia. . There are 39 breeding colonies on the offshore islands of South Australia with the largest being found on Dangerous Reef and the famous Seal Bay on Kangaroo Island. There are about 10,000 Australian Sea Lions following the introduction of the Australian National Parks and Wildlife Act of 1972 which prohibited their harvesting which began when Europeans colonised Australia. The front flippers are used on land to prop themselves up, and in the water to swim with. They use their back flippers rather like a leg on land, and as a rudder in the water. They have a second layer of fur under the top fur layer, and this helps keep them warm in the cold water, together with a thick layer of fat. Males (called bulls) can reach about 2.5 metres in length and weigh about 300 kilograms, females about 100 kilograms. They eat fish, octopus, cuttlefish, small sharks, rock lobsters and even birds. They hunt close to the seafloor and can feed in depths of up to 300 metres.